Searching for the music festival to beat all music festivals? KAABOO Cayman is coming to the Cayman Islands and you won’t want to miss it. KAABOO Cayman is more than just music and it goes beyond a festival. Its music, art, culture, and cuisine jammed into one amazing event. KAABOO Cayman is a new kind of party for people who love entertainment. It’s an escape for those looking for paradise. With more than 25 years of experience bringing KAABOO Cayman to music fans, foodies, art lovers, vacationers, and islands residents, this event’s organizers know how to enliven the senses. World-class bands, inspiring artwork, belly-aching comedy, phenomenal fare and libations that just keep flowing are just some of what’s in store for you at KAABOO Cayman 2019. Held on a strip of famous Seven Mile beach with the Caribbean Sea as a backdrop, KAABOO Cayman is the perfect getaway and celebration of life. The tides have shifted and you now have something entirely different in a music festival. Two days of sounds from around the world, tastes from all over the globe and more. KAABOO Cayman is all about fun. But, it’s comfortable too. Attendees let loose, but they respect their surroundings. KAABOO Cayman is a break from the daily grind, and it’s a chance to come together where different backgrounds and perspectives align perfectly alongside the waves. Experience the enjoyment and cleanliness of KAABOO Cayman, a music festival where every detail has been well-thought-out and designed to be memorable. 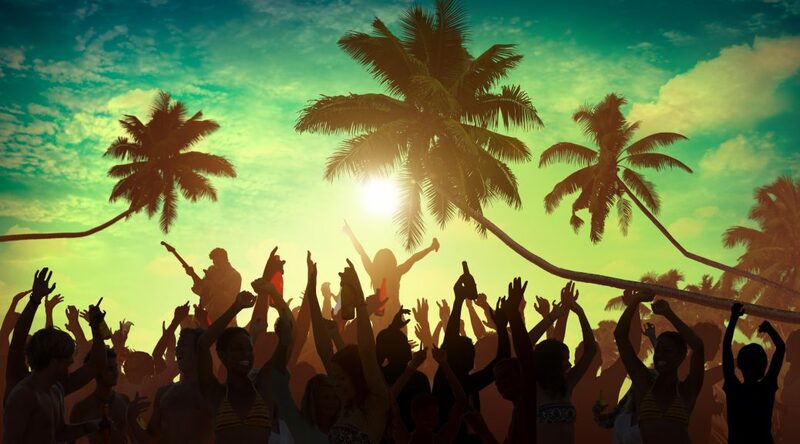 Event Venue – The ideal place to hear a concert, view great art and eat fantastic food, Seven Mile Beach’s northern end welcomes you to KAABOO Cayman 2019. The average temperature in February in the Cayman Islands is a beautiful 77°F, so wear your lightweight clothes and kick off your shoes. Book your room at South Bay Beach Club and you can be at KAABOO in minutes. The Music – Who’s going to be at KAABOO Cayman? Well, only The Chainsmokers, Jason Derulo, Duran Duran, Flo Rida, Blondie, Zedd, Bryan Adams, Counting Crows, Blues Traveler and dozens of other artists you’ll want to hear. Comedy acts include Norm MacDonald, Kevin Nealon, and Darrell Hammond. Food and art and this beach party by day and night club at night will be headliner quality as well. Contact us to find out more about KAABOO Cayman and to book your rooms for this not-to-miss event.